Last week, I finally received my first Google Adsense check! I just find it so amazing to see my name on the check. For the past years, I have been using my friend's account until I created my own account addressed here in Singapore. My check amounts to S$ 148.87. 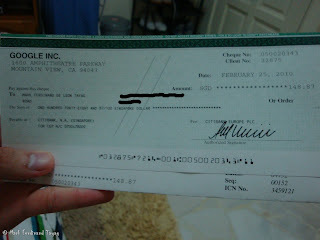 I am surprised that I received the check quite fast, less than five days.